Disclaimer: I agreed to write the “compte rendu” this time on the condition I could do it in English because I am a bit lazy and it will be more understandable than if I do it in French. Actually, that’s not quite how it happened. I said I wouldn’t be able to write it because I could only do it in English and someone* thought that was a good idea and that I should write this one, so I’m sorry if you don’t understand (*you can blame Marie). We chose La Roche à Roche in la Turbie as there were a couple of beginners in our group (Béa and Jenny who both started in September) and this seemed like the ideal spot. The day’s participants; Claire, Marie, Elsa, Béa, Jenny and myself arrived mid-morning and were joined after lunch by Cécile and Émilie. Yes, yes, I know you’ve just counted and worked out I had to spend the day in the company of seven pretty women, but don’t worry I didn’t complain too much ;). The weather by the way was perfect, sun shining without it feeling too hot, the mosquito like buzzing of the radio controlled cars zooming around below and the noisy chatter of our loud Italian neighbours subsiding now and again just long enough to remind us how lucky we are to be in the region. Once the pre-climb discussions had come to a close (tip of the day: you can put nail varnish on your quickdraws (dégaines) to identify them, though you might face some awkward questions if you try this as a man) we put up the ropes on the Ecole Maternelle (4c). 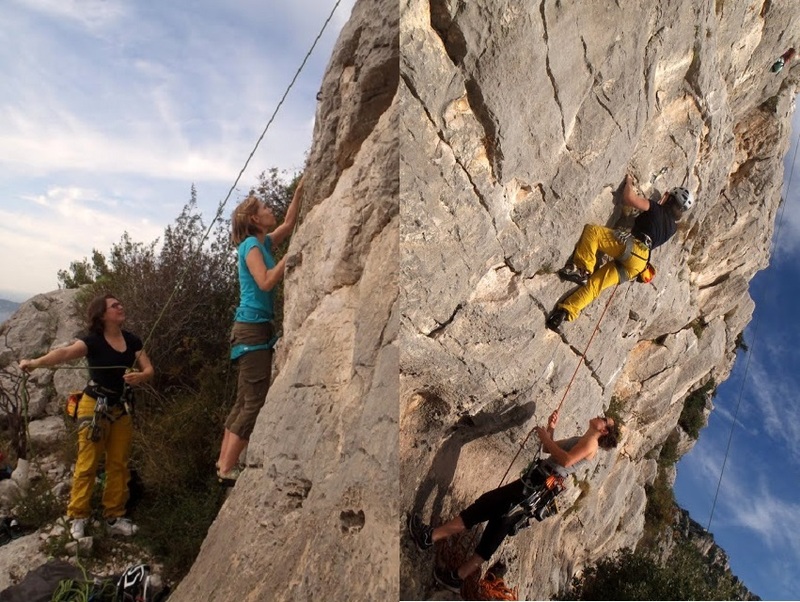 Bea and Jenny took turns belaying the lead climber (assurer le grimpeur en tete) under the supervision of Marie and Claire. 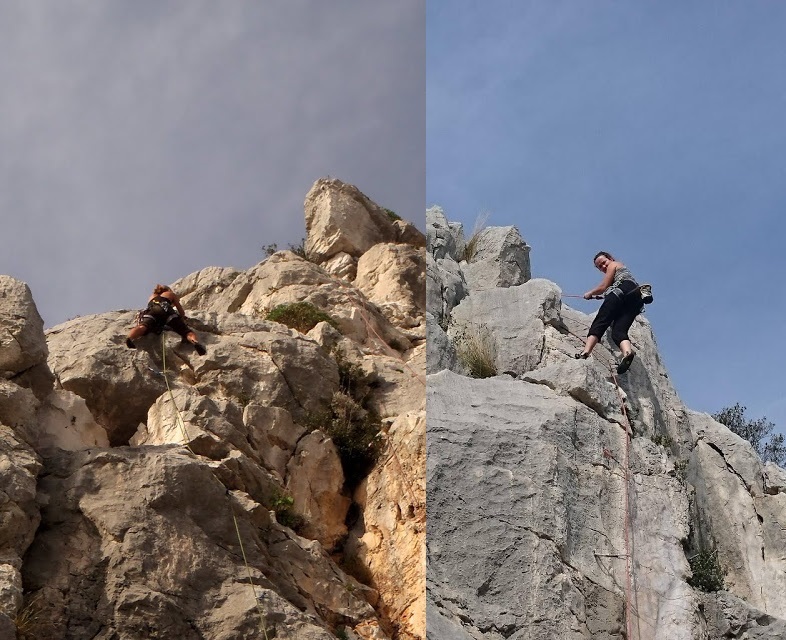 Once the rope was up, they both succeeded in top roping (grimper en moulinette) the route (la voie). 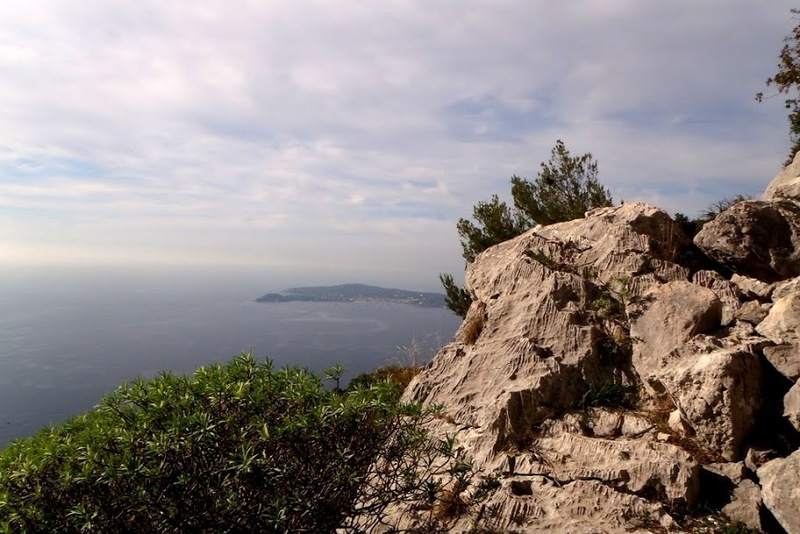 A little shaken but motivated by a mixture of adrenaline and the eager encouragements of the other climbers, they went on to claim their certificat d’etude (5a). Marie, who is building a strong reputation at ASSA for her culinary excellence didn’t disappoint and was soon handing out some delicious biscuits to keep our energy going. I had a pleasant surprise when I found out Jenny was half American and we could chat in English and admire her New York accent. I should point out one of Béa’s objectives for the day aside from actually climbing was getting a good profile photo to prove it. Marie was very patient and obliging, climbing up with her to get the perfect shot. I think Béa has updated it now, you can vote on what you think in the comments ;). Over the course of the day we had a few finger injuries, three I think and a bit of blood. Fortunately as well as organising the day and baking the biscuits, Marie also thought to bring along a much needed first aid kit. Following her injury, Émilie took over as the official photographer. As the day drew to a close and we were heading back we went to check out La Dalle à L’Oiseau, which turned out to be very busy. There was however a free 2c, a perfect opportunity for Béa to do her first lead climb and clean the anchor (faire la manip) at the top. Claire and Cécile teamed up to explain how to clean the anchor, whilst a complicated system to put Cécile up by the anchor to observe Béa was worked out. 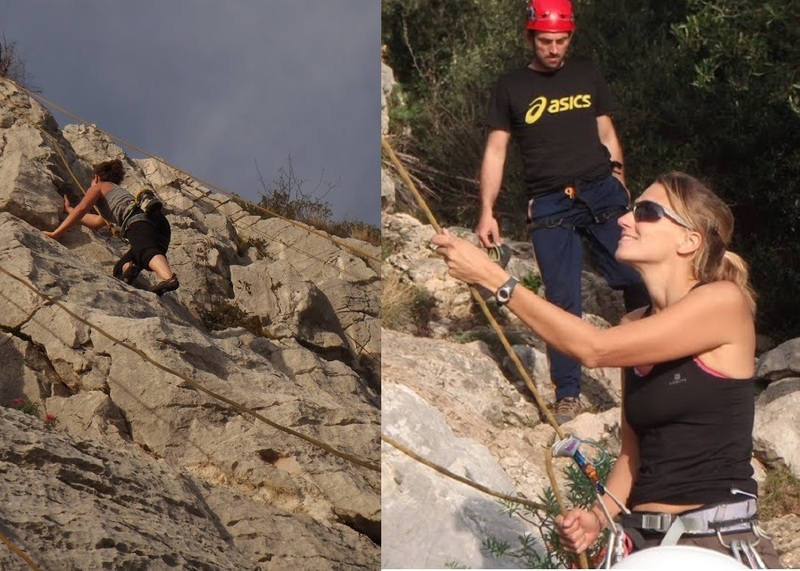 First, Marie lead climbed to put a rope in place for Cécile, then came back down again taking away the quickdraws she’d used. 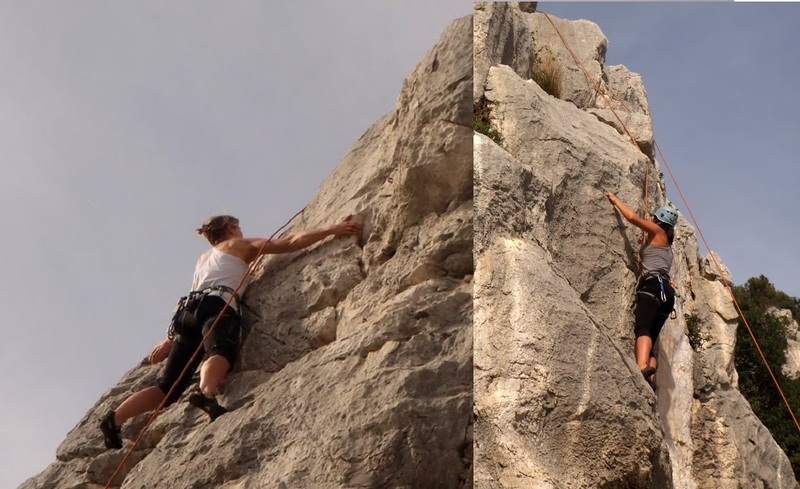 Then Cécile went up top roping and anchored herself at the top before sending the rope back down. We considered leaving at this point (just joking Cécile) but instead, Béa went up lead climbing to join Cécile who guided Béa through cleaning the anchor, whilst Émilie provided extensive photo coverage. Once Béa was down Cécile rappelled back to join us. 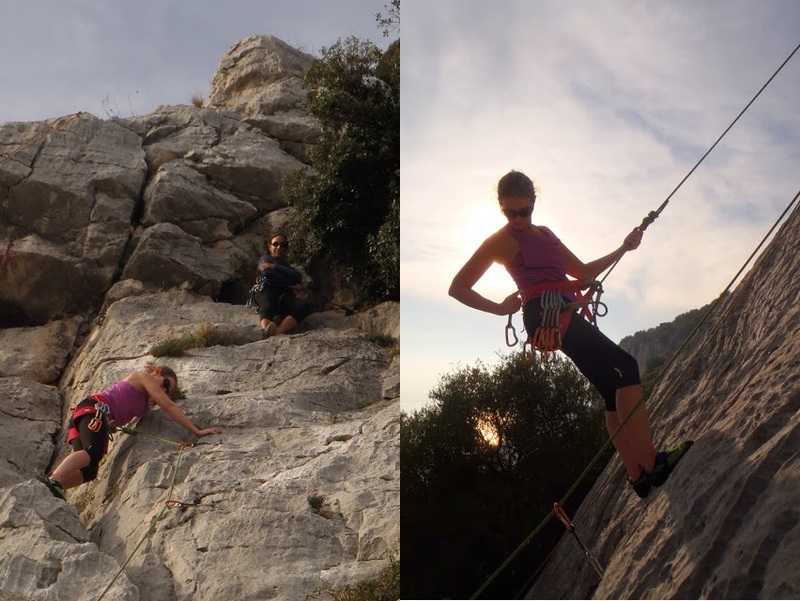 Whilst this was going on, Elsa and Marie persuaded some Italians to let them use their rope and climbed a nice arête (Plein la Vue) with more photo coverage by Émilie. All in all it was a great day out. Thanks to everyone for all your support to the beginners and for making it such a great day for them. ← Fais pas ci, fais p’ASSA, viens sur Facebook, mets toi là !